FastKlean is a company that is rapidly gaining more and more popularity in the UK. 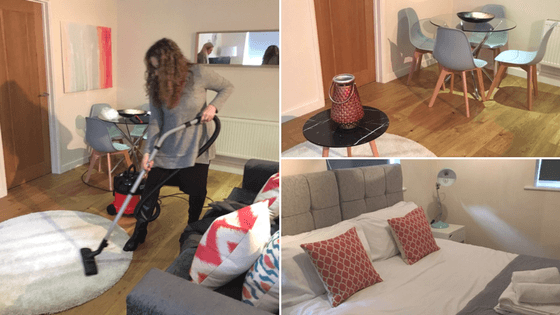 Our cleaning services have helped numerous people across London and surrounding areas enjoy their free time far more. Over many years we have built a huge client base but numbers have never been that important to us. The most important detail for FastKlean is client satisfaction: always has been; always will be. Nothing makes us happier than a client praising our work. What makes us even happier is when clients share their positive encounter with others so they can also benefit. Leaving an online review on our service is something we highly encourage and in this blog you will find out what incredible real life stories these can create. We were recently contacted by a company that offers luxury serviced apartments for short and long term let. They had been impressed by the positive feedback left by people praising our cleaning COMPANY on one of the big directories for recommended businesses. They recognised that we were probably the perfect partner for all of their cleaning needs and we were happy to prove them right! As you may know, serviced apartments need to be highly presentable and in pretty much perfect condition. These properties are often picked by people who want to live in a home that lives up to the top-end of their expectations. Sometimes even CEOs and Managing Directors make serviced apartments their homes whilst they search for that perfect permanent residence. These are far cosier than a faceless 5 star hotel but, needless to say, the cleaning standards for these properties are also as high or indeed higher. Since our company has plenty of experience with such cleaning projects, we were immediately interested in exploring this opportunity. Our CEO and one of our Supervisors arranged a meeting with their representative who had intended to show us a clean luxurious apartment, set their requirements for the job, get a quote on the service and then go over all the fine details of the cleaning project during that meeting. This had been planned a mere few hours before the new tenant of the apartment was due to arrive and begin their stay. Well, when we arrived, the scene wasn’t exactly the one that our client had expected!! Disaster!!! It turned out that, for some reason, cleaning of the apartment had never taken actually taken place! Just to remind you, this is only a few hours before the arrival of the tenants and the place was in a terrible condition! Their company representative was naturally embarrassed and really upset as it was likely the new tenant would refuse to take the lodgings and there could then be serious consequences. At the heart of our company are strong ethical values and a professional attitude. Our cleaning business has developed successfully due to the supreme efforts and diligence of our staff, including our CEO and founder, Antoaneta Tsocheva. Once she and the supervisor assessed the situation, they immediately offered their help. Now how often do you see the CEO, of a company you want to hire, personally demonstrate the high quality of their company’s services? Sure enough and without hesitation, Ms. Tsocheva got to work, sometimes even on her hands and knees, and impressed the client with the standards she achieved when cleaning the place. With help from our supervisor, we showed the client first-hand what FastKlean is all about: leading through example and setting high standards on every level of the corporate hierarchy.